Pimp Mama Kris is on the phone with her koven’s on-staff team of plastic surgeons right now to tell them to immediately jet to wherever Kendall Jenner is, because she needs them to put that dehydrated piece of cauliflower stalk back together after being turned to dust by two simple words that easily leaped out of Naomi Campbell’s mouth. Andy Cohen read a question from a “viewer” about Kendull being the highest-paid model and saying she’s very selective about what fashion shows she graces with her uncooked Malt-O-Meal presence and would never do 30 shows a season like other models do. The “viewer” wanted to know what Naomi had to say about that, and without missing one beat, she took a page out of Queen Aretha’s Playbook of Immaculate Shade by commanding Andy to move on to the next question. Andy probably planted that question to get a beef going between Naomi and Kendall, and with one look and two little words, Naomi scorched that beef real quick before throwing it into the trash. If looks could kill, Kendall would be more deader inside than she already is after that. With his chonies still moist from Naomi’s Kendall “shade,” Andy brought up the shoe-throwing tussle between Cardi B and Nicki Minaj at the Harper’s Bazaar ICONS party thrown by Carine Roitfeld during New York Fashion Week. Andy thought that Naomi was at that party, but she let him know she was at a better party (read: a couch party with Kate Moss) and her party had actual icons at it, thankyouverymuch! “Is that so?” said every lady housekeeper and assistant who has felt the wrath of Naomi the Terrible after reading her words about not wanting to see women fight. At the 11-second mark in this video, you can practically hear the groan from Andy’s assistant after they realize they’re going to have to hand him a new pair of underwear during the commercial break since he wrecked his while thinking about how much attention Naomi’s response is going to get him. If Naomi was at that party, that fight would’ve lasted approximately 3 milliseconds. 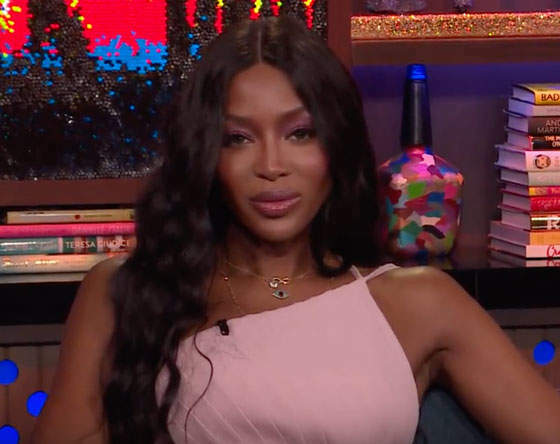 Because as soon as Cardi and Nicki started yelling at each other, Naomi would’ve thrown them a devastating “What are you non-icons even doing here?” look, and they’d both take off a shoe and slap themselves with it before escorting themselves out of there.